The Children’s Memorial Grove & Flag project was conceived by Alameda County Supervisor Gail Steele. Adopted unanimously in 1996 by the Alameda County Board of Supervisors, the Children’s Memorial Grove & Flag Project remembers children who have died by violence in Alameda County. A special Children’s Memorial Flag was designed to be flown at half staff on the Friday after a child dies by violence at county buildings, schools, and other participating agencies. 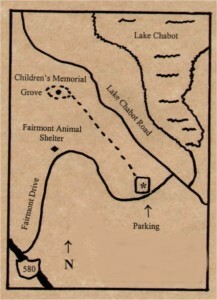 In addition, Alameda County has created the Alameda County Children’s Memorial Grove atop Fairmont Ridge. Each year, Alameda County and the East Bay Regional Park District holds a ceremony at which they read the names of the children who have died in the previous year, and plant an oak tree in memory of each. Alameda County hopes that Congress will adopt their program and declare the last Friday in April as Nationwide Children’s Memorial Day. The Jenny Lin Foundation is very pleased at the efforts of Alameda County and especially Supervisor Gail Steele to ensure that violent crimes against children are remembered. We are proud to participate in the yearly Memorial Grove Ceremony.